You know you’ve found a favorite restaurant when you can eat there twice within a week, and the second meal is even better than the first. 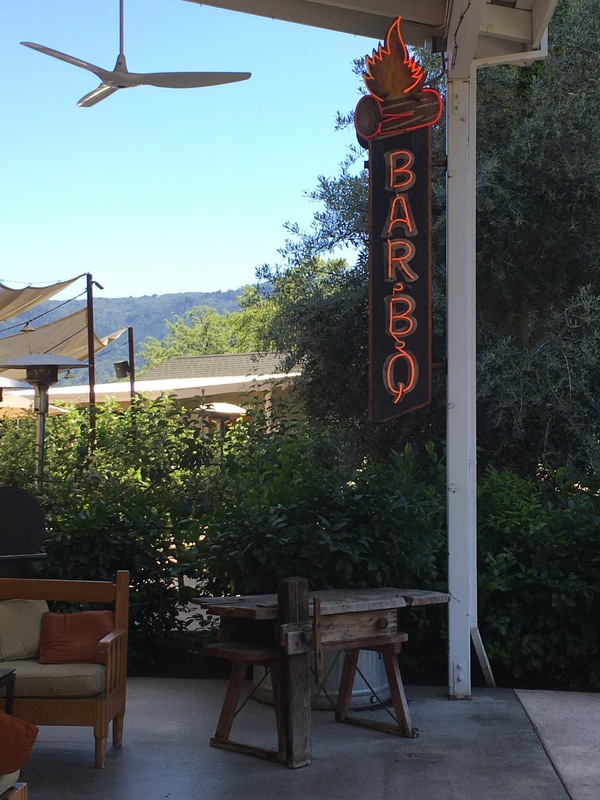 That’s how I feel about Farmstead at Longmeadow Ranch, a Napa Valley restaurant that is a must for anyone traveling through the area, no matter how short your stay. 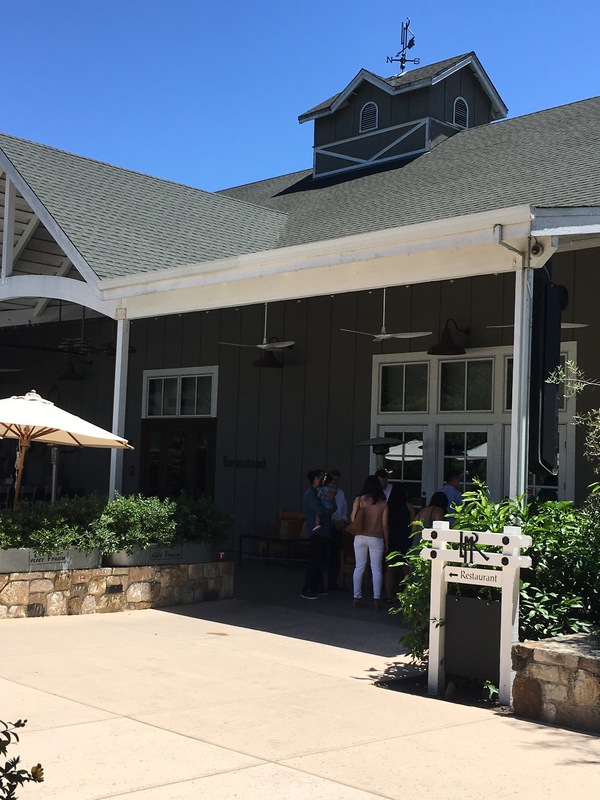 Longmeadow Ranch, like so many other winery-centric businesses in the Napa Valley, many businesses in one: tasting room, general store showcasing local products, casual eatery, fine restaurant, and private event venue. While all are well done here, it’s the restaurant, Farmstead, that takes center stage. Having first tried Farmstead at the behest of a foodie friend last summer, it was an instant hit with me. 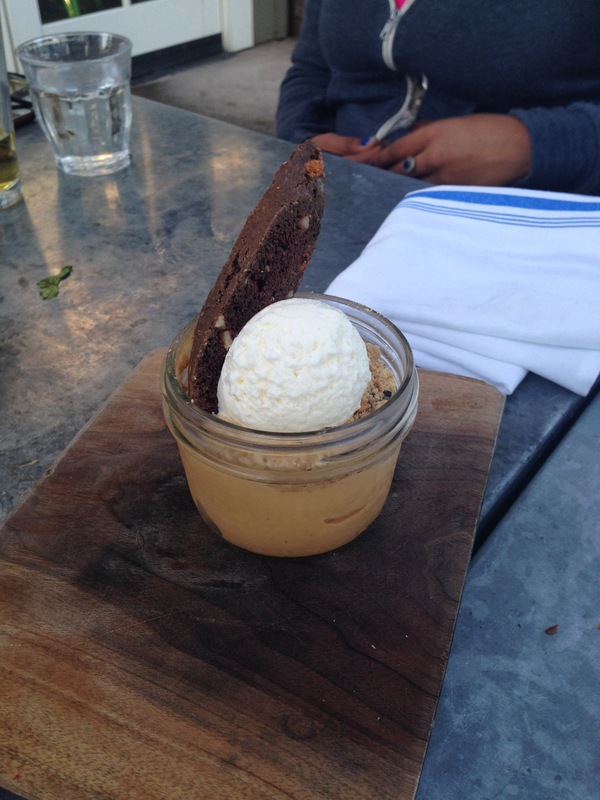 Its shareable burrata appetizer and an addictive butterscotch pudding – so good our party of four ordered one and decimated it so quickly we ordered two more! – won me over. Alas, I was too slow to blog about it then. But two more recent visits later, and here I am, telling you that YOU. MUST. EAT. HERE. Fresh, local, and creative. Longmeadow Ranch takes your favorite food trends and innovates them – enough that they are recognizable but unique and great enough to be memorable. 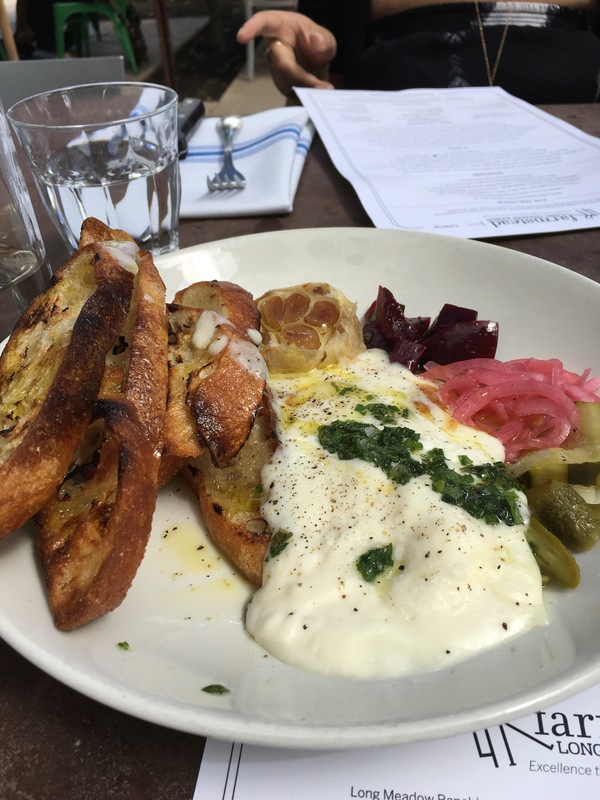 Let’s talk about that Burrata, for example. Cool, creamy, oozy burrata is so good on its own, why mess with that? Longmeadow Ranch hears it. The result is basically mozzarella fondue, and it works beautifully. Try it alone, with its crackling olive-oil crostini, with a clove of accompanying roast garlic squeezed on top, with a dose of pickled onions or gherkins on top, or the marinated, pickled beets – or a little of all of the above. While part of me would like a sweet element to offset the saltiness and richness of the cheese, the different bites of various savory flavors still manage to to bring out different aspects of the burrata itself. Who knew burrata could have such versatility? 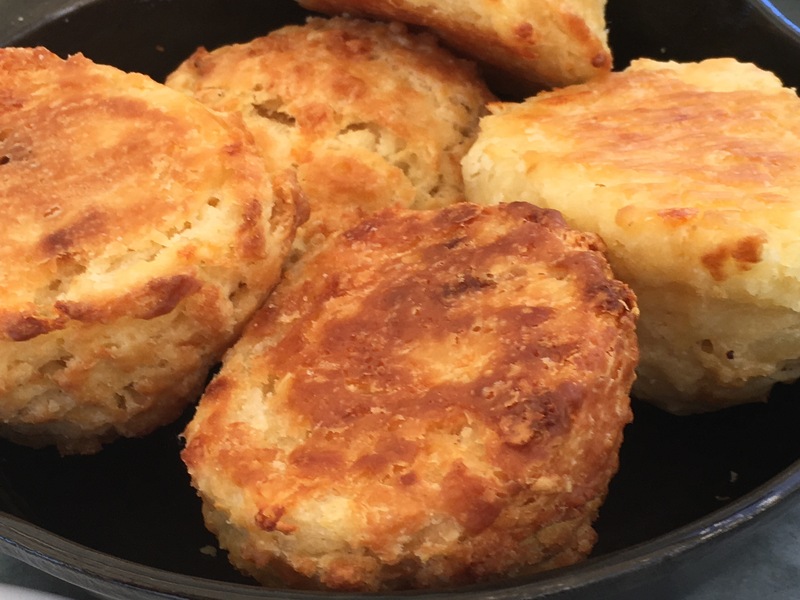 Love cheddar biscuits? Farmstead serves theirs slightly caramelized in a cast iron skillet with honey butter. They are nowhere near your heavy Cracker Barrel biscuit, but if you’re a Yelp user, you’ll be delighted to find out that they can be yours, complimentary, should you choose to check in on Yelp. Ok, let’s talk about this menu. First, the drinks. Farmstead makes some great cocktails; if you don’t like wine, they have many great ones. Beers aren’t a strong suit, so pick the cocktails, mocktails, or wine. Tip: Try a tasting next door, purchase a bottle and drink it at the table for $5 corkage – you’ll save a bunch over ordering off the restaurant menu. I love their Sauvignon Blanc. It is crisp, clean and versatile. Perfect for a warm afternoon on the patio, surrounded by greenery. The rosé is also fantastic – light, dry, fruity and tangy with watermelon and strawberry notes. The food: Their current summer menu has many great options for starters, entree salads, and main courses. 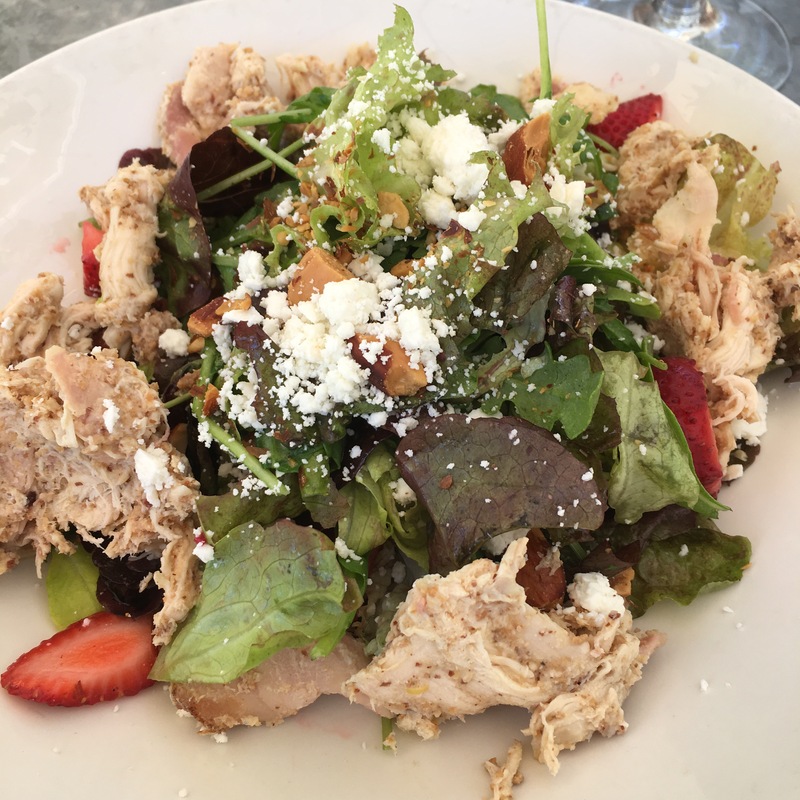 On my recent visits I opted for their summery salad with mixed greens, strawberries, feta, and almonds with pulled chicken first; on the second visit, I chose two small plates: beets and meatballs. Let me just tell you that the beets and meatballs were extraordinary. I’ve talked in this blog at length about a few of my favorite food trends of the decade, including beets, Brussels sprouts, and kale. As cliche as they all can be, the last 15 years have made vegetable side dishes so delicious that people like me order them as an integral part of the meal and not a simple afterthought. In that perspective, I can’t roll my eyes when I see yet another version of them on a menu. Because they’re still nutritious (well minus all the additives to help them along) and delicious. I am a fan of a sweeter, cold, pickled beet, but Farmstead again takes the route less traveled by making them savory and caramelizing them. 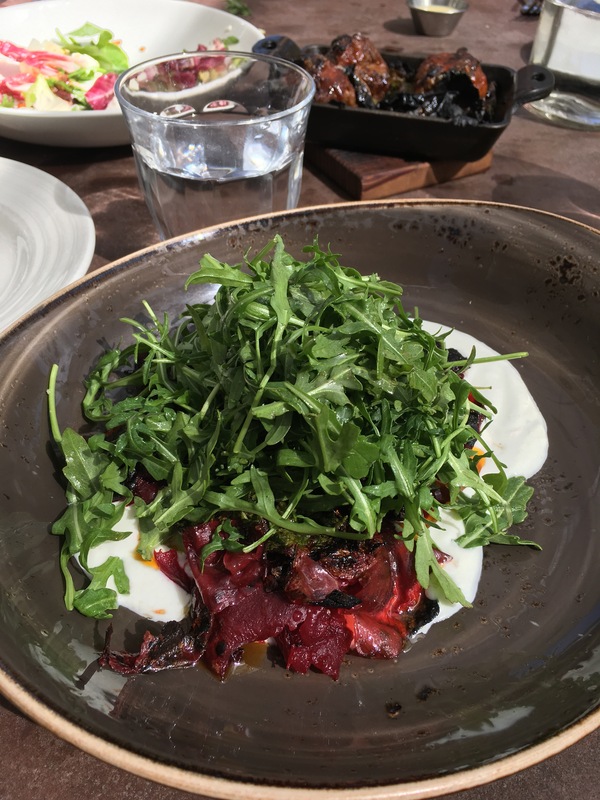 Beets’ dense and juicy texture doesn’t lend themselves naturally to caramelizing, but Farmstead has made me rethink that assumption. The caramelization created an umami smokiness that paired well with the smooth, mascarpone-like goat cheese presented with it. 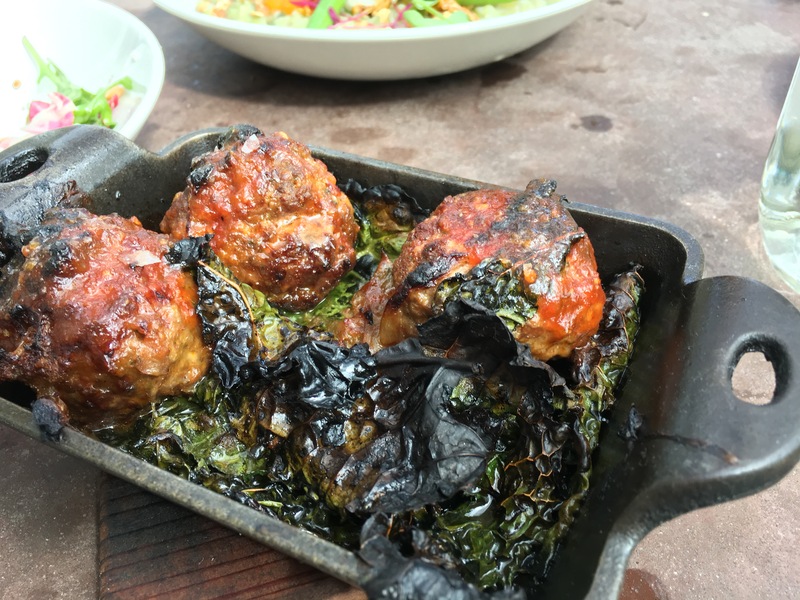 The all-beef meatballs also came as a harmonic and hearty small plate. Served with a tomato jam – really, reduced sweet tomato sauce and collard greens that had been broiled with high heat for an almost kale chip-like consistency, I could have eaten this dish or the beets alone as a filling main course. Our server had recommended them together, and I am grateful for the recommendation, as the two dishes did contrast nicely with one another. 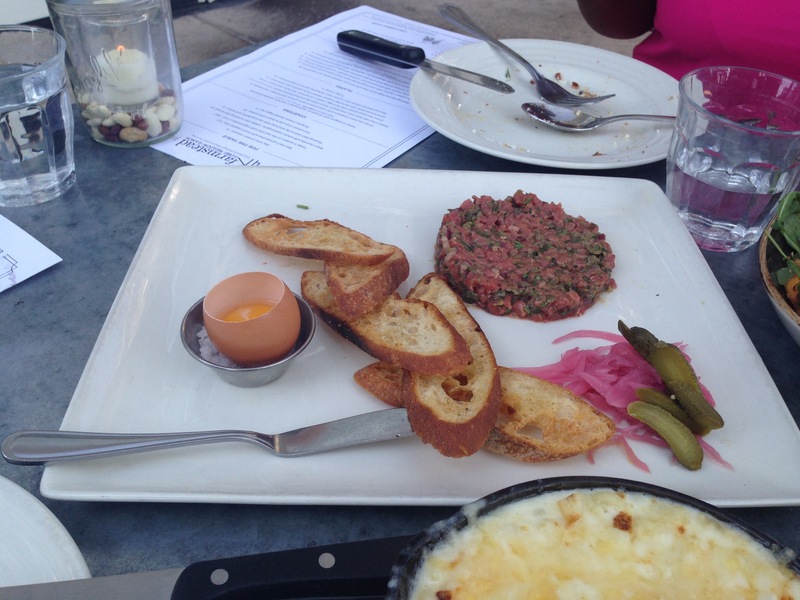 My friends on these visits ordered beef tartare, macaroni and cheese (both pictured above), the pulled pork panini (not pictured), a vegetarian arborio rice dish not called risotto (but essentially was risotto), and the capellini primavera. Each one was fantastic in its own right. 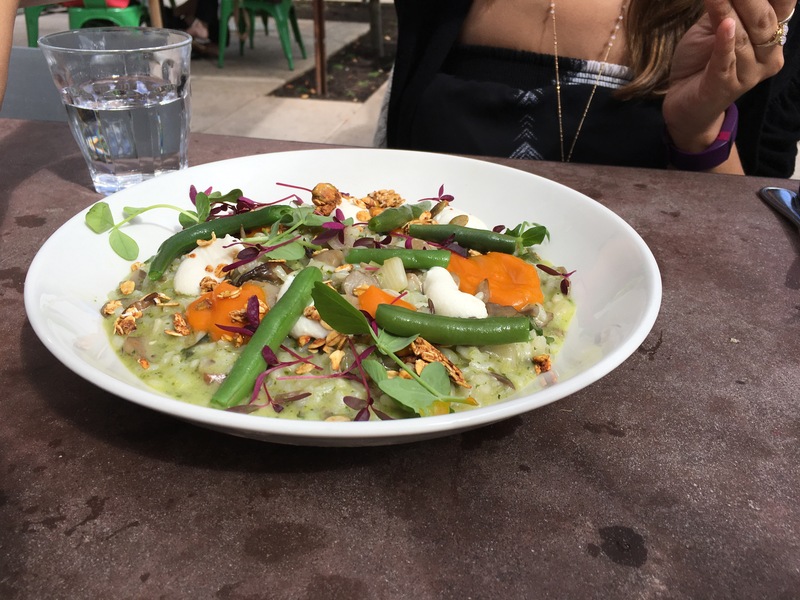 The ricotta capellini primavera, had an interesting tang to it, hinting of yogurt. The mac and cheese is one of those dishes worth the calories. My one caveat for Farmstead is its lack of restraint with salt. I happen to love salt, but if you have sensitivity to salt, simply ask them to go easy on the salt, as their flavors tend to concentrate anyway and don’t necessitate salt. For dessert, their new pastry chef frequently rotates dishes. 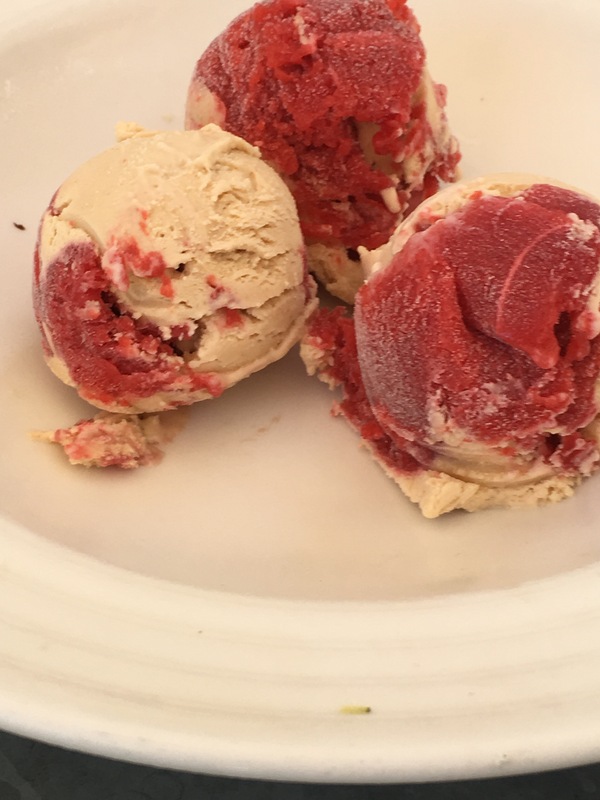 Homemade ice creams and sorbet are delicate and vary daily; flavors on our visits included peanut butter and jelly (yum! ), cucumber, and lemon-raspberry. Sadly, the memorable butterscotch pudding (photo near the top of this post)was a creation of the previous pastry chef, but we hope it will be resurrected later this summer (!). Other tempting dishes include fruit pies and cobblers. 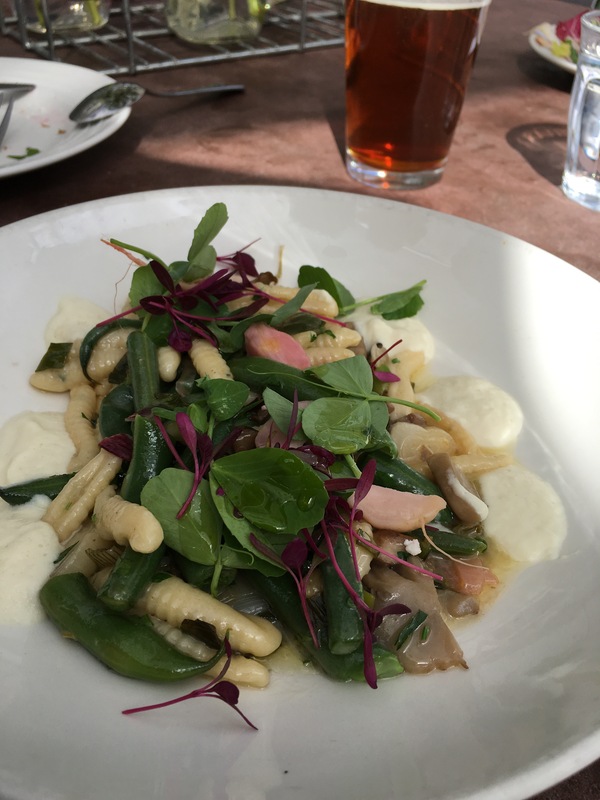 I can’t recommend Farmstead at Longmeadow Ranch enthusiastically enough. You’ll leave with a new or renewed appreciation of Northern California’s local bounty and culinary talent.